Trigger-Happy Kittens Launch Double LP: Meowgeddaboudit! THK’s 2nd Moog-Based LP Commits Armed Knobbery On Indie Electronica! 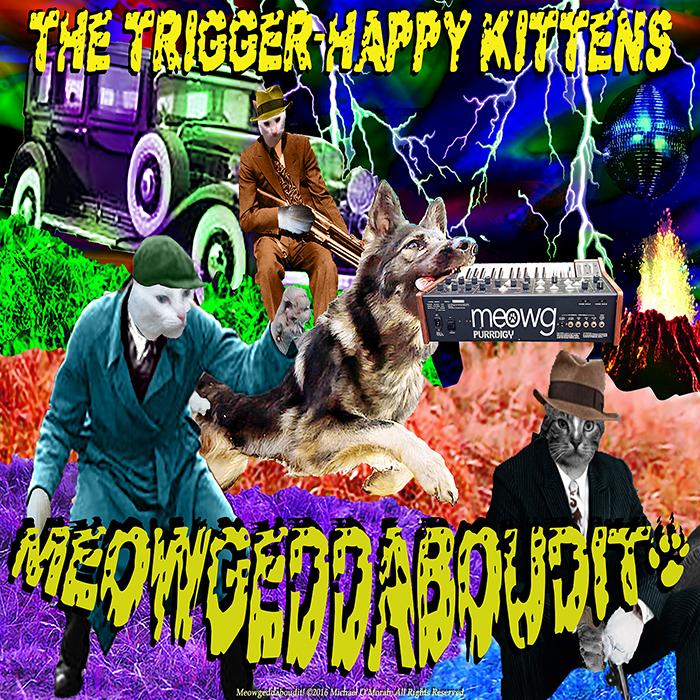 Lawrence, KS – Sep 4, 2016 – The Trigger-Happy Kittens, produced, performed and engineered by Michael O’Morah, release, “Meowgeddaboudit!”, their second Album, a Double LP of Electronica with attitude. Meowgeddaboudit’s shocking 131 minutes encompasses 20 Tracks of genre-leaping Progressive Trance, Techno, Acid House and Synth-wave. Many Tracks, like “Cats in the Keys”, have already seen airplay with Listeners’ enthusiastic response. The Album also includes a first vocal foray, “It’s The Trigger-Happy Kittens and the Small-Town Drug-Dawg”. The Number One Electronic Music Act in Lawrence, KS and a leader in the Greater Kansas City Area, Since 2013 The Trigger-Happy Kittens have striven to create and perform Original Moog-based Underground Indie Electronica. Their Weapons of Choice combine Synthesizers, Sequencers, Drum Machines, Expression and Effects Pedals which build entrancing Rhythmic Harmonies to thus create vivid atmospheres of Tenacity, and Inspiration. Children of the 60’s Michael and his Assistant, Sweetp were Spoon-fed Progressive Electronic Acts, i.e. ; ELP, Tangerine Dream and Tomita. Some compare the Trigger-Happy Kittens to groundbreaking Acts like, Joy Division, Tangerine Dream and Kraftwerk. Founded in July 2012 by Michael O’Morah, The Trigger-Happy Kittens endeavor to compose and record Analog Electronica that defies Genre. Now, thanks to DistroKid, they have expanded their Distribution to Digital Music and streaming services like iTunes and Spotify worldwide and will soon be releasing Music on their own Label, Dual Dragons Records.